A petition for AMD to update their FX processor family with new products based on the steamroller architecture has gathered 50 supporters. The petition was started around 15 days ago amassing 50 supporters till now which shows that some people are still interested in the FX processor series. Please release high end FX processor with steamroller microarchitecture. Steamroller is already in the new APUs called “Kaveri” so it’s a big shame not having it in a high end FX CPU because a lot of people are waiting for Steamroller FX high end CPU. I hope you consider the release of high end Steamroller FX CPU as it’ll make many people very happy! Now as much as i want AMD to release an FX series family based on the Steamroller architecture, i know its not going to happen anytime soon. AMD has just released their Kaveri APUs which are the first consumer products based on the new architecture. We talked about Steamroller’s x86 performance a few months back prior to the Kaveri platform launch where AMD was specific in regards to their steamroller architecture’s x86 performance which isn’t matchable to an Intel equivalent core. Looking at Bulldozer and Piledriver, its pretty clear to see how much AMD are behind in terms of performance. A new architecture wouldn’t suffice to gain on Intel hence the only logical step for AMD is to focus on APU development and improve upon the coherent architecture they are promising since some time now with HSA support. The fusion of both CPU and GPU in a package aimed towards value users has proved a success for AMD and they are continue this trend for a long time in both mobile and desktop platforms. 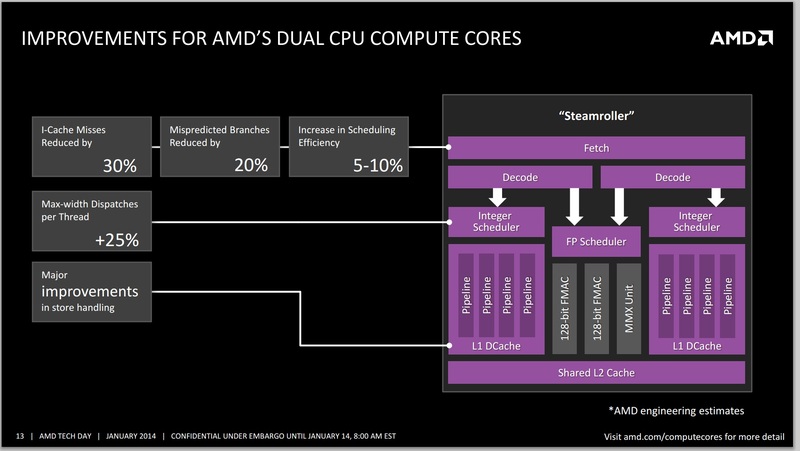 AMD’s Kaveri based lineup would also consist of pure x86 based Athlon parts with Steamroller cores. These processors could be the hot cakes of the lineup for consumers using discrete graphics cards. We have seen Mantle in action which could boost the CPU side by in-depth utilization of these cores. However, moving in the future, AMD would focus more towards ARM and low-power chips for servers while the big cores would either be canned or reduced only to APUs. We have seen AMD’s Opteron roadmaps which clearly show nothing uptill 2015 that isn’t based on Piledriver. Steamroller on the other hand is being introduced in Berlin APU/CPU and ARM based Seattle which is a clear sign of what AMD plans on focusing towards in the future. This is the sad truth of the industry and the current information clearly points out to this transition but hopefully, AMD would keep the APU brand alive and we would still be seeing innovations on that end as HUMA/HSA becomes more mature and API’s such as Mantle hit the high road.